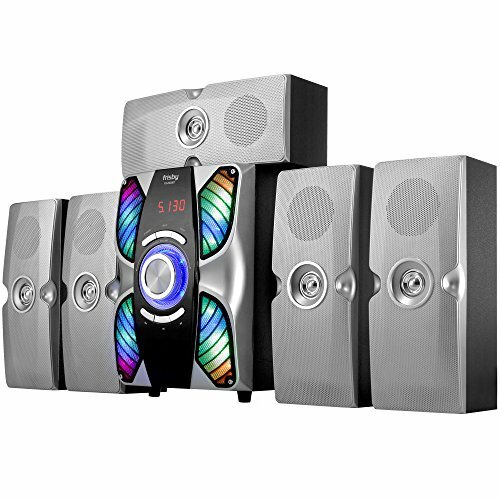 The Frisby fs-6900bt is an all-in-one surround sound system that has many features that you will enjoy. The Bluetooth audio streaming feature on this system is excellent; you can connect your smartphone's, tablets, laptops or even Bluetooth capable desktops to stream audio or music wirelessly. It also includes built-in media ports for playing media via usb, SD or with an auxiliary to rca cable (included). This system has an LCD screen which allows you to see what mode you are on, adjust eq or even adjust each speaker's individual volume level one by one for a more custom balanced sound. The subwoofer provides plenty of high quality bass at 50 watts of power, with each speaker at 15 watts. This all-in-one system is ready to go just plug it in and you are ready to rock! all speakers and the subwoofer are magnetically shielded to provide the protection against image distortion from external electronic sources. Compatible with most PC models, laptops, tablets, smartphones and all MP3 players, iPod, Discmans, Walkman's equipped with headphone jack. The included remote control has controls for bass and treble eq, volume, play/pause, previous/next track, Bluetooth sync and power. The speaker also has an LCD display and volume/sync buttons. Warranty : 1 year warranty exchanges for factory defects.